Birmingham is to be the first city in the UK to use cutting edge battery technology that removes the need to attach overhead power lines to its historic buildings for trams. 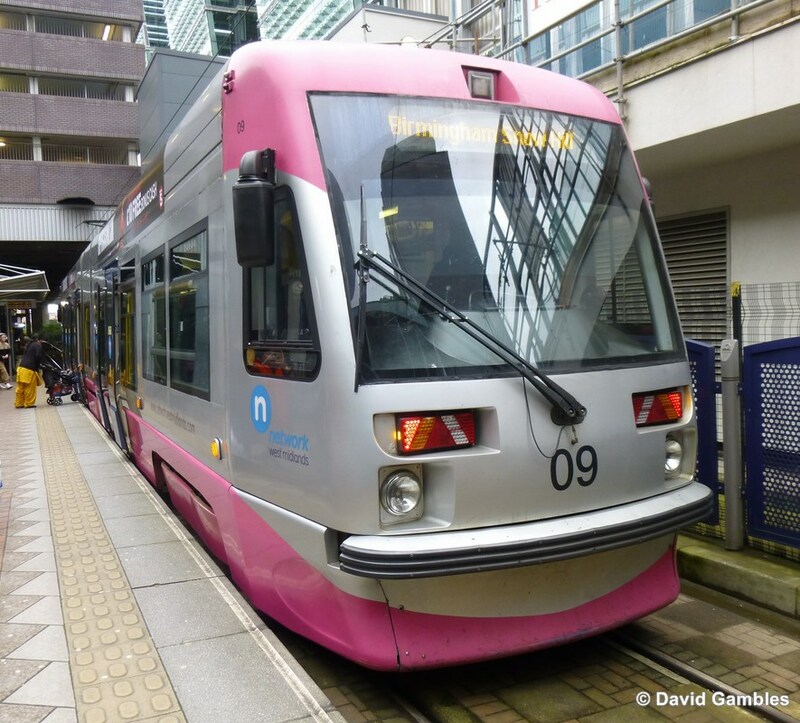 The fleet of Midland Metro Urbos 3 trams are to be fitted with hi-tech batteries to power the vehicles through architecturally sensitive areas. 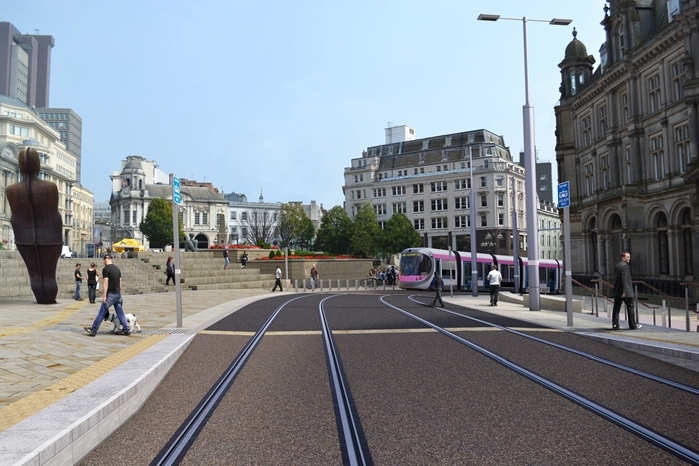 Known as catenary-free running, the go-ahead has been given by the West Midlands Integrated Transport Authority (ITA) to the plan by Centro, its delivery body. 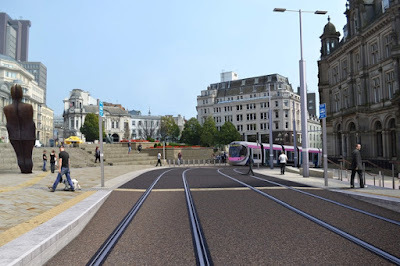 It means there will be no need for overhead cables around the 182-year-old Town Hall in Victoria Square when the city centre Metro line is extended through from New Street station to Centenary Square. It also means the planned Birmingham Eastside extension running under the proposed HS2 station at Curzon Street will not need expensive infrastructure works to accommodate overhead lines. 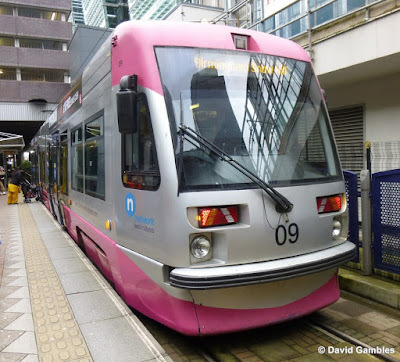 Cllr John McNicholas, chairman of the ITA's delivery committee, said: "When we placed the order in 2012 for our new fleet of trams the ITA had the vision for them being capable of running without overhead wires. "The technology then was not sufficiently developed to incorporate into the Birmingham city centre extension, but provision was made within the contract that should technology catch up the new trams could be retro-fitted with batteries. "That is now the case and the application of battery technology on this scale in the West Midlands will be a historic first for the UK light rail industry and the modern era of British tramways." The current 21 tram fleet was made in Spain by CAF. Urbos 3 trams already run catenary-free in sections of the tram networks in Zaragoza, Seville and Cadiz in Spain but use supercapacitors to provide on-board energy storage. However these would be unsuitable for trams negotiating the steep hill in Pinfold Street from New Street station into Victoria Square. Overhead lines and equipment would have been needed, marring the architecturally sensitive environment of Victoria Square. 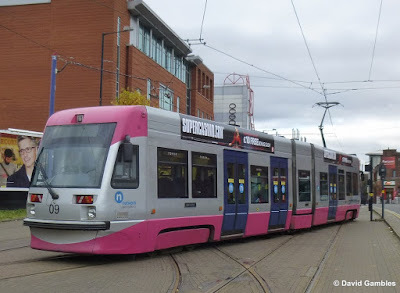 However CAF now says newly available lithium ion batteries are robust enough to handle the gradients and can be fitted so trams are ready to run when the extension to Centenary Square opens in 2019. The batteries will be fitted on the tram roof and will be recharged by the overhead lines along other parts of the route. They are expected to require replacement at approximately seven-year intervals. Four new trams to allow the fleet to keep the current level of service once the Centenary Square extension opens have already been ordered and will come with batteries fitted. The proposed Wednesbury to Brierley Hill extension is also being evaluated to identify catenary-free sections. The saving just from catenary-free operation on these four sections is £650,000, but longer term there will be greater savings as there is now no longer any need to prepare roads or buildings for overhead lines. This includes the Birmingham Eastside section where the extension runs under the proposed Curzon Street station along New Canal Street. The lack of headroom under the new station and the existing West Coast Main Line bridge would have meant major works to lower the road to install overhead lines - work which will now not be needed thanks to catenary-free running. Negotiations have begun with battery suppliers but the final cost is not yet available. However a £3.15m contribution will be made by the Greater Birmingham and Solihull Local Enterprise Partnership and £1m will come from industry association UKTram.